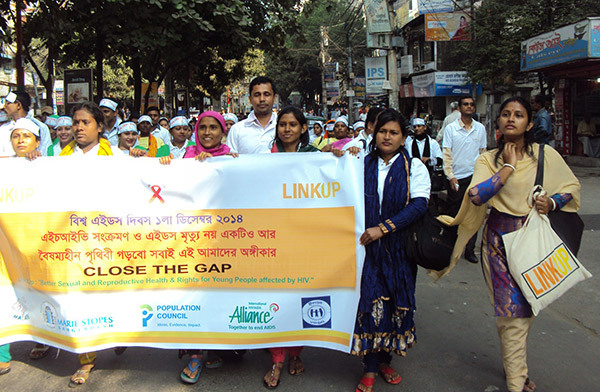 YPSA observed World AIDS Day 2014 in Chittagong with the theme “Getting to Zero: Zero new HIV infections. Zero discrimination. 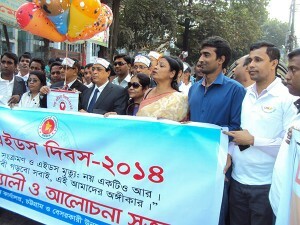 Zero AIDS-related deaths.” Department of Health in Chittagong and different NGOs jointly organized Rally and discussion meeting to mark the day. Mezbah Uddin, Deputy Commissioner of Chittagong inaugurated the program by hoisting balloons and festoon in the rally in front of Chittagong Press Club. The day was started with a colorful rally participated by the people from all walks of life including different organizations, government official, NGOs and individuals with colorful banners, T-Shirt, festoons, posters, sun caps, musical instruments etc. YPSA attended the rally with colorful Banner focusing on the World AIDS Day with theme of the year. The rally started at 9.30 am from Chittagong Press Club and ended at Civil Surgeon Office. After the rally a discussion meeting was held at the Department of Health office where Dr.Adhir Rajan Das, Deputy Director (Health), Chittagong division was present as chief guest and Dr.Sharfaraz Khan Chowdhury, Civil Surgeon of Chittagong as special guest. Dr. Rafiq Uddin Chowdhury, Deputy Civil surgeon of Chittagong presided over the discussion meeting. Ms. Khaleda Begum, Team Leader of YPSA was present in the program.